As Retro as it gets! Tucked away in my collection of old photographs is a picture of my Mum & Dad leaving to go on holiday on their 650 ‘Bonnie’. Now this was taken about 40 yrs ago and I could swear that it’s the same bike that I currently have on test! We all remember countless hours spent in dimly lit garages crawling around on dirty floors or looking under workbenches. We just had to find that c-clip that just flew off the piston pin, it was all that we needed (we thought) to get some old "fixer-upper" back together again. Well anyway I do, and I also remember my Dad doing it almost every weekend in order to keep that ‘Bonnie’ in working order.Now 40 years ago women could easily fall for a man on this bike. 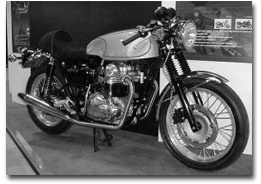 It looks just like the Triumph’s, Norton’s and BSA‘s of that period which demanded such attention after the likes of Marlon Brando and the infamous movie. But times have changed, nowadays it's a little harder to convince the girls that you're cool when you ride past on the W650. Still, it's not impossible to turn their heads as I found out to my surprise! Times have definitely changed and in some ways it’s for the better. If it weren’t for bikes like this then we probably wouldn’t have the fabulous machinery we have today. So where does that leave this one? It's not race-rep or a sports tourer, it isn’t a big-bore cruiser or a commuter, and it certainly isn’t a beginner's bike, even though it could be with its low seat height and classically simple design. It's a retro classic that gets its looks and design from the famous bikes of the past and then adds a lot of modern flair and technology in all the right places. 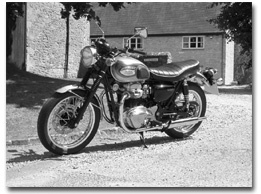 If my Dad had had this bike all those years ago he would have been over the Moon, it really is everything you ever wanted your old Triumph, Norton or BSA to be. Reliable, no oil leaks, powerful (ish! ), smooth and good brakes! It’s a bike to be proud of and to keep for another 40 yrs, and I’m sure it will last that long as the build quality and finish is probably the best I’ve ever seen on any Japanese bike. 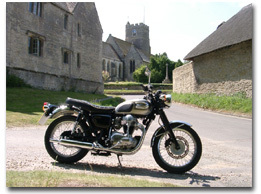 Cruising around in town or out on meandering country roads is what this bike is all about. Dressed in my black leather jacket, jeans, boots and open face helmet together with the obligatory shades, I did my best to pay homage to days gone by and ended up on the receiving end of many a thumbs-up. Not bad, I thought. Ok so you may well feel a little out of place when you're sitting at the lights and the latest and greatest 600/1000 race-rep pulls up alongside. But, with those twin burbling exhausts and the sheer presence of that totally open, and beautiful motor just ticking over beneath you soon forget about any other bikes and carry on with your mission. To prove your point at green the motor revs up in a flash, you drop the clutch and this bike just storms away from the race rep (well at least for the first few yards until he realises just what has happened!). You can’t hear anyone else because the now burbling exhaust has turned into that unmistakable throb of a British twin on song. It’s just magic! 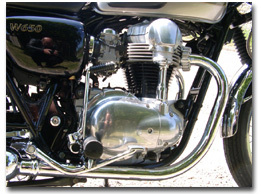 Kawasaki designed the W650 to capture a sizable portion of the Japanese niche retro market. They are currently falling over themselves trying to acquire the originals, like the old Kawasaki W1 from the early 60’s. 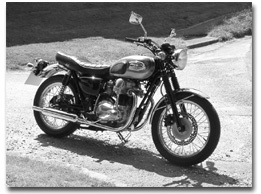 The W650 was never intended to be sold in Europe but demand forced Kawasaki to import the bike to our shores. Good for us, and right on Kawasaki for being a bit different! The W650 thrives in speeds from five mph up to 80 mph, after that be prepared for the most wind blast you can experience on any bike! There is a bit of vibration at higher speeds but only in the bars, and it’s acceptable. In between those speeds the 650 delivers you with sufficient oomph to propel you out of corners with flair and you will definitely run out of ground clearance before you run out of tyre. The W650 has what look to be vintage style tyres fitted, even the sizes are vintage in comparison to today’s bikes, but there's no reason to worry about vintage-style traction levels. Fitted with a ribbed front section 100/90-19 and a rear 130/80-18 it certainly looks the part but these Bridgestone’s certainly do a good job of keeping this bike on the road. Everything on this bike is mounted in an old-style tube-steel cradle frame that's painted black (black is bad!). To compliment all of this it has spoked aluminium rims, black rubber gaitered 39mm conventional forks, and five-way preload adjust dual shocks on the rear. Yes it has that authentic nostalgic harshness but it’s well damped although a bit soft when you first get on it. Surprisingly when you are on the go, the suspension isn't that bad, which is good. It's nimble enough to chuck around with ease but yet seems to have a long forgotten British bike trait commonly referred to as "hinge-in-the-middle" when ridden hard! 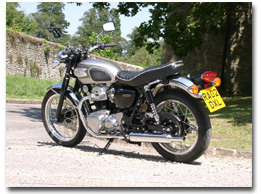 The W650 has been produced as close as possible to the original so it even has ‘that’ special feeling built in. Still, its predictable, grips well and is far superior to anything from the 60’s. More nostalgia gets added to the braking department here. The W650 gets a 160mm drum rear brake and, even though the front brake is only a single 300mm disk and a four-piston caliper they work well in bringing this bike down from speed. Performance is pretty good for a bike designed as a true retro but it’s not even close to that of a current naked 600 Honda Hornet or similar. With around 50bhp and 43ft-lb of torque to propel it’s 195kg it’s no street racer. Interestingly enough this the W650 is about 15kg heavier and about 15% larger overall than it’s 60’s counterparts, still it has enough power to send the ‘oldest’ model Kawasaki up to around 115mph, not that you’d want to do it for long though!! I’m quite certain that just the sound of this echoing twin mentally adds a good ten horsepower to it, that sound as you cruise along just goes straight through you. Add to that the way people stare at you on this bike and the plain fact of its uniqueness and here’s a package not to be missed. How good do you feel when people (bikes or non-bikers) wave or signal their approval at you, it's all emotion, let this bike take you back to your forgotten youth or an era when motorcycling was still an adventure - at any price. Life’s too short so why not relax a bit and get away from the ultra fast and ultra powerful license losers on today’s market. This bike oozes cool, its certainly a bike I would have in my garage for riding out on those sunny days down leafy lanes to a country pub where it would more than likely be the centre of attention (again!). And on your departure you just get on it, swing out that kick-starter and fire it up first time in true old-school style – now how cool is that!